Dave Hanacek has one of the most animated voices you’re likely to hear — and if you’re a fan of modern rock, you’ve no doubt heard it. 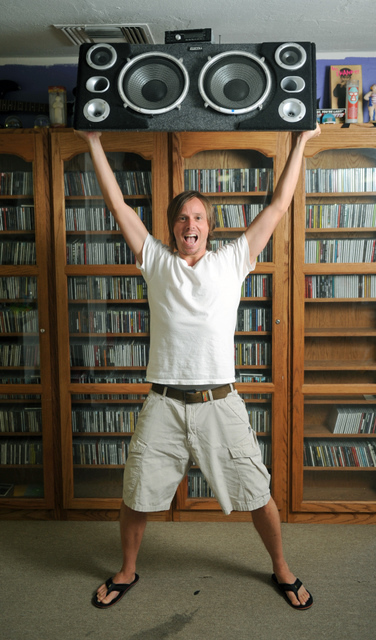 As the music director of KJEE 92.9 FM and host of the radio station’s popular weekday show from 9 a.m. to 2 p.m., Dave is a mellow guy who unleashes an enormous passionate energy about the latest music upon the microphone. The atmosphere at his office is fun, reminiscent of a college dorm, and the Goleta-raised DJ is the kid down the hall who knows everything about music and owns the biggest collection of vinyl and signed posters from the coolest rock bands. Below are his answers to the Proust Questionnaire. This is a very hard question for me and I could take weeks thinking about it, but it doesn’t get any better than The Beatles. So many memories growing up. Another hard question for me but right off the bat I think of a band called Bedoiun Soundclash and their song “12:59 Lullaby.” I get goosebumps everytime. Who has been your favorite interview on the radio? I’ve interviewed just about every band we play on KJEE, but Chris Cornell of Soundgarden stands out. He came in and took over the lunch hour with me one day and it was unbelievable. Great human. I play a little guitar but I would love to be able to just plug in an electric guitar to a stack of amps and solo like Hendrix. Touring Europe twice in a band. It was a childhood dream! And of course being a father of twins. An ice cold Black Bird Porter and a bowl of pretzels from Island Brewing Co. I’m a simple man. My old, beat-to-death acoustic Gibson guitar. Falling. In dreams, life, or otherwise. No doubt my parents. Being a parent myself I realize it’s the hardest job you can have and I made it even harder for them. Pure admiration! Down to earth folks are my favorite, right? Being arrogant is the worst. What a waste of time. When they grab the tab. Honestly, just a lazy day with no plans and the family around the pool or at the beach. Being easy to get along with. I’m very social, especially with that porter. “I can’t say it hasn’t been fun.” I try to squeeze that into the end of my radio show whenever possible. It’s just stuck with me through all these years. Not being confident enough in all aspects of my life. I have never forgot the beauty and mystique of Bora Bora. I can’t imagine living there full time but I would in a heartbeat. The pure innocence of my four-year-old twins. Life is so funny with them. They have it made man. I’ve been into music ever since I can remember. I even recall listening to my very first Elvis record in kindergarten. It was on a pocket record player from Sears. So it’s rare being able to listen to music everyday and love what you do.